At the law firm of Johns, Mitchell, Duncan & Lowe, L.L.C., clients in Clinton and throughout the surrounding areas of western and west-central Missouri find aggressive, personal representation in a variety of legal practice areas. Founded in 1972, our law firm is committed to fighting for the best resolution for you. Our attorneys draw upon their 47 years of combined experience to help accomplish that goal. Family law: We handle many different aspects of family law, such as divorce, child custody, child support, spousal support, adoptions, prenuptial agreements, paternity matters and more. Personal injury: We represent clients injured in motor vehicle accidents, in slip-and-fall accidents, by defective products and more. Criminal defense: We defend clients who have been charged with all kinds of felonies and misdemeanors, from DUI/DWI to assault and battery. Legal malpractice: We represent clients who have been wronged by negligent attorneys or law firms. Our three Missouri lawyers graduated from law school with honors. You can rest assured that they will bring the legal knowledge, skill and determination to your case that you require. You can also depend upon our dedication to providing personalized service and attention to each and every one of our clients. We work hard to tailor our representation to meet your unique needs. 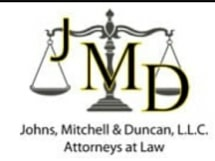 Johns, Mitchell, Duncan & Lowe, L.L.C., offers free initial consultations and accepts credit cards. Our office hours are 8 a.m. to 5 p.m. on weekdays, but for your added convenience, our law firm offers night and weekend hours by appointment. Johns, Lilleston & Mitchell, L.L.C. Johns, Mitchell & Duncan, L.L.C.